Well, his whole name was Friedrich Heinrich Karl de la Motte, Baron Fouqué, but that was too difficult, so even my book only says "La Motte Fouqué" on the title page and never elaborates. 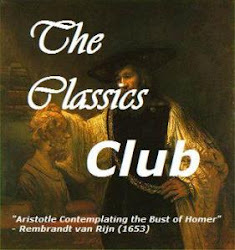 He lived from 1777 - 1843 and was a German Romantic to the core; my little Oxford World Classics book (from 1932) says we "may now recognize in Fouqué the latest and the most uncompromising of the Romanticists, the man who accepted most unflinchingly the principles of that school, and who carried them out most thoroughly." 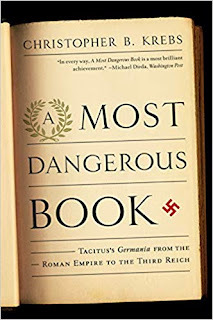 It also calls him "somewhat stupid" and goes on to note that his output "was positively prodigious, and most of it, so far as modern readers are concerned, might very well have been left undone." Poor Fouqué! The introduction does allow him several stories to keep for posterity, and these four make up the majority of them. It must be admitted that these stories are...odd. Undine was not what I expected at all and neither was Sintram (those being the two that I had heard of at all). They are a little on the overwrought side and I would like to propose them for a Reading Rambo Readalong. I'm not at all saying they're bad, but you should know that indeed they are very much in the Romantic vein. 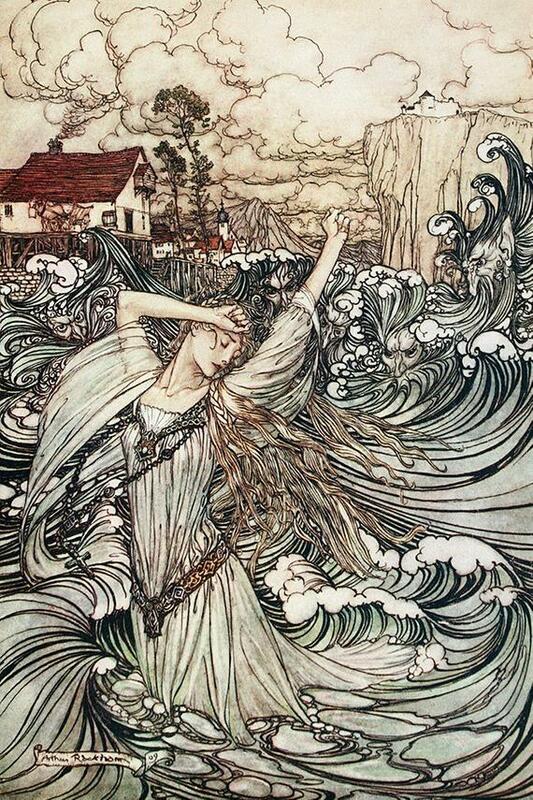 Undine is, I think, the most famous story. A knight travels through a dangerous forest, and on the other side he takes shelter at a fisherman's hut. His foster-daughter is Undine, a lovely girl of 18 who acts very childishly; she is always playing tricks and changing moods. 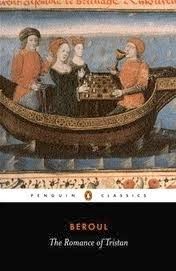 The knight, Huldbrand, is stranded at the hut when the river floods, and so he and Undine fall in love and are married by a traveling priest. 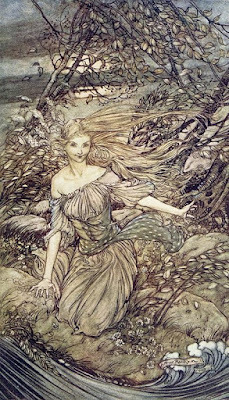 Undine promptly turns into the ideal woman, and explains that she is a water-spirit and had no soul until she got married. 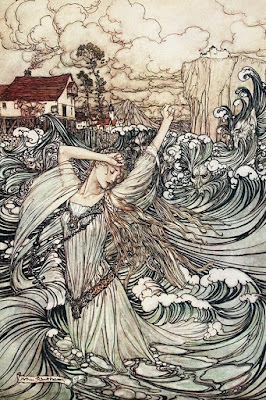 Her uncle, Kühleborn, is the spirit of the river and will make mischief if he can; and if Huldbrand is inconstant to Undine, he will take her back home to the water. Huldbrand is a less than ideal husband, and once he's got Undine, he starts thinking maybe he should have married Bertalda instead. Bertalda ends up coming to live with them as a friend, but that goes about as well as you might expect, and eventually Undine is snatched back down to her watery home. Sintram and His Companions -- I know I've heard mention of Sintram somewhere, possibly in an E. Nesbit novel,* but I never expected what I got. Sintram is a Norwegian knight with a dual nature; he yearns to be pure and spiritual, but also wild and vicious. He careens between the two poles of his being, and the great temptation of his life is his infatuation with his guest Gabrielle, the wife of the perfect knight Folko. He is constantly tempted (by the devil!) to somehow abduct Gabrielle and make her a Helen to his Paris. It takes Sintram his entire life to conquer the darker corners of his soul. 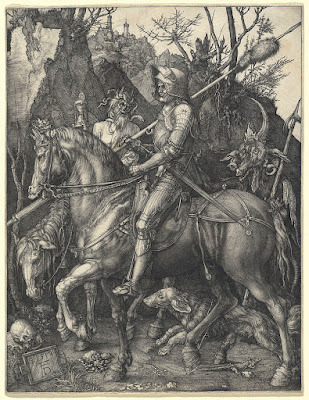 In a postscript at the end of the story, Fouqué explains that he based it all on the Dürer engraving "Knight, Death, and the Devil." Two short little stories round out this volume. In Aslauga's Knight, a Danish knight (from my own Fyn!) with a folklore hobby falls in love with the long-dead, legendary Aslauga and decides to serve her in knightly fashion. At the next tournament, he is sometimes tempted by the great beauty of the princess, but every time Aslauga appears to chastise him. Besides, the princess is obviously destined for the shy young (and bookish!) Edwald. The Two Captains may be the zaniest of these four pretty zany stories. Two soldiers, a Spaniard and a German, start as friends but become deadly enemies. After a battle with the Ottomans, they both pursue the beautiful enchantress Zelinda out to the Sahara desert (which is surprisingly thickly inhabited). Will either of them win her? Will their friendship survive? Several times night had followed day and day night when Heimbert one evening, as the dark came on, was standing quite alone in the endless desert, unable to see a single fixed object around him....Sometimes he heard some one’s footstep or the rustle of spreading cloaks go past him; then he drew himself up in haste and alarm but only saw what he had seen often enough in those days, the wild beasts of the wilderness, wandering through the desert in joyous freedom. Now they were ugly camels, then long-necked awkward giraffes, and then again a long-legged ostrich, sailing along hastily with uneasy wings. So, Fouqué didn't know a whole lot about the Sahara, but after all it was about 1820. Anyway, I had so much fun reading these tales -- they are simply drenched in Romanticism, and although we've nearly forgotten them today, I think they're well worth reading for anybody interested in 19th century literature and/or Romanticism. 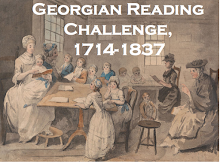 They became part of any Victorian's basic reading background. *A quick bit of research reveals that both Undine and Sintram were hugely popular in English and made it into the canon of popular children's tales, with several retellings published in the late 19th century. The Bastable children play Sintram at one point, which must be where I picked it up. 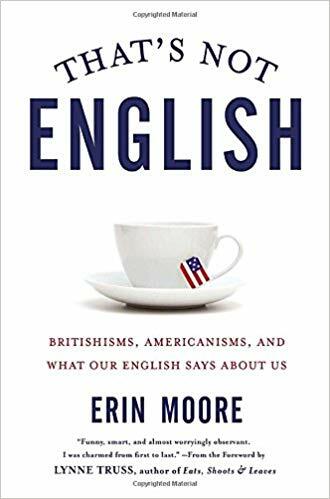 This was a fun, fast read that I enjoyed a lot because I will never not want to read books comparing the British to Americans and vice versa. I cannot get enough of those. Indeed, I use quite as an intensifier that means just plain really. Apparently Britons aren't quite that enthused when they say it. Moore says that English parents say to their children "You get what you get, and you don't get upset." She then comments that "These sentiments are so un-American it is not even funny." This shows that she really hasn't done her parenting in the US, because everybody I know says "You get what you get, and you don't throw a fit" several times a day. Indeed my kid's red hair has always been considered enviable, and pretty much only that. She considers 'ginger' to be a term of pride. Someday I'd like to see a real British pantomime. I'd be completely bewildered, even though I do kind of know the basics. One of the strangest sentences in this whole book is about American actors appearing in panto: "In recent years, both David Hasselhoff and Vanilla Ice have played Captain Hook in regional English theaters...as I write this, Henry Winkler -- the Fonz himself -- is playing Hook in Liverpool." 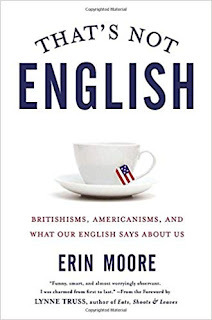 Moore says that if there is one Americanism that Britons never, ever pick up, it's dude. 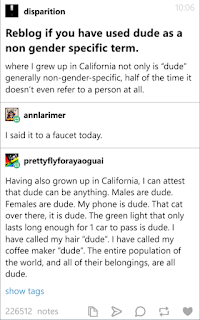 I would LOVE to talk about dude, folks, so any British people reading this, you have to tell me what you think about dude. 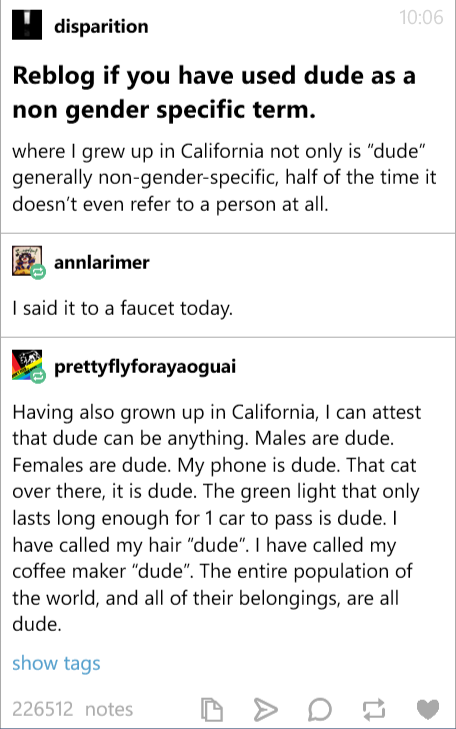 I, being a California girl, cannot go an hour without saying dude. I don't notice that I'm doing it -- it's a less noticeable word than like (which I also say, but not nearly as much). I clearly remember being in Denmark, in 1989, and trying to help the English teacher learn how to say dude. You have to say it in that particular way, you see. And here's the thing about dude: it is the single most flexible, most adaptable word in English. You can use dude to express virtually ANY emotion, with the possible exception of deep, heartfelt love. Deep, heartfelt sympathy, yes absolutely, but preferably not a marriage proposal, though I'm sure it's been done. Of course, you've seen the little meme going around about how dude can address anyone and anything. Or maybe you haven't, so I'll put it here. It is completely true. I can quite see that a Briton would probably find it a non-comfortable word to use. I'd just like the discussion. 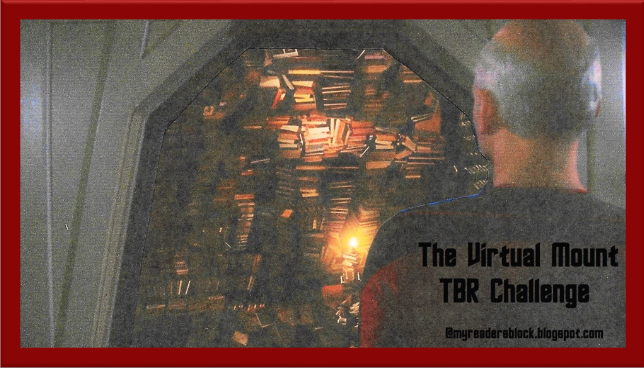 Yes, indeed there are other reading events besides March Magics, and here they are. 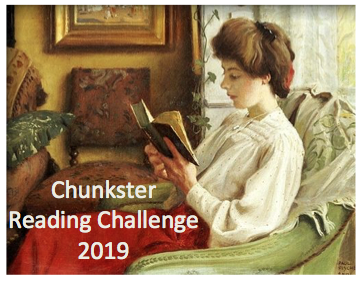 Paula at Book Jotter is hosting Dewithon 2019, also known as Reading Wales. Read anything by a Welsh writer, or about Wales! My trouble is, all the Welsh books I can find are fantasy novels I've read before, but I have this copy of Elidor, by Alan Garner, that I haven't read in a long time, and also Jasper Fforde wrote a fantasy trilogy I haven't read yet, so I got The Last Dragonslayer. I plan to enjoy those, and sometime I will get my hands on some Serious Welsh Literature. 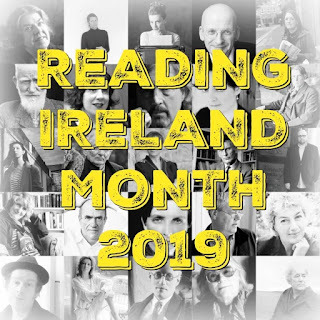 Cathy at 746 Books is hosting Reading Ireland 2019. She's even going to have weekly themes! 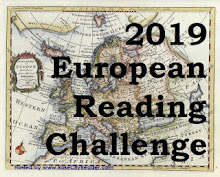 It so happens that I put a battered old book of Yeats on my TBR list for Adam's challenge this year, so I'll read that. Looking into it properly, I find that it contains Stories of Red Hanrahan, The Secret Rose (also a collection of stories), and Rosa Alchemica -- a novella perhaps? I really have very little idea of what is in this book, and was pretty surprised to see a publishing date of 1914 when I inspected it just now. It's pretty elderly but I didn't think it would be that old. I've never read anything by Yeats that wasn't poetry, so we'll see how I like his prose. Alan Jacobs teaches at a college, and he wants us all to learn to think a bit better -- especially on Twitter. Really thinking is not easy; it's uncomfortable, and kind of hard work, so our brains don't like to do it. 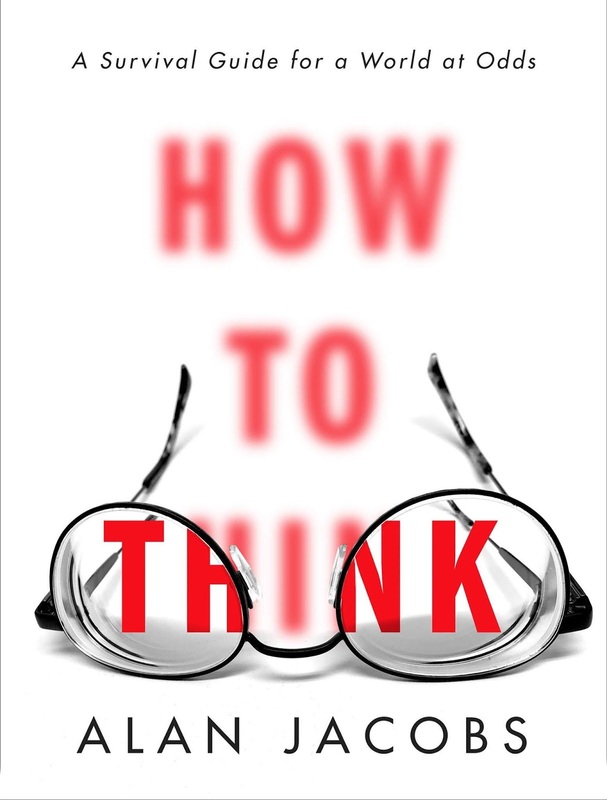 So in short chapters, Jacobs tackles various aspects of thinking well. 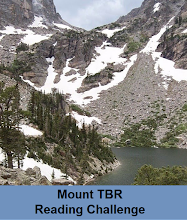 One of his first points was kind of unusual; he observes that it's not really possible to 'think for yourself.' Usually, what we mean by 'thinking for ourselves' actually means thinking with different people, changing our thoughts to be more in line with some other group. Thinking is a social activity and does not occur in a vacuum -- you have to interact with other thoughts. Jacobs' big thesis, though, is the paramount importance of ingroups, outgroups, and the Inner Ring -- and of learning to deal with our instincts for othering. We all have what he calls 'repugnant cultural others' -- people whose beliefs are so different that it's very easy to think of them as Other, and pretty soon as not human. Learning to think involves exercising patience and understanding of that other, because unless you can truly understand those you disagree with, you won't be able to communicate, persuade, or be persuaded. It's a great little book, full of interesting stories and examples. 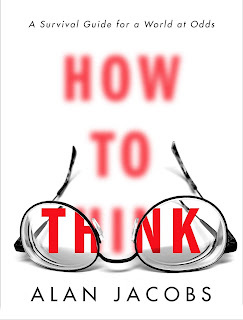 I highly recommend it as a quick education in thinking, plus it will make you feel pretty uncomfortable every so often, which is all to the good. The DWJ readalong this year will be Howl's Moving Castle, and the Pterry title has yet to be chosen. Kristen is running a poll at the announcement post, and I voted for Wee Free Men on the grounds that I haven't read it in a long time. (Update: it's official; Wee Free Men!) I'll have to think about which favorites I want to read in March....it's hard to choose! There are so many to love. I just realized I'm wearing my Death "I could murder a curry" t-shirt as I type this post. It was a Christmas present. If only there was a good DWJ t-shirt out there -- does anybody have a good DWJ image I could put on a t-shirt? 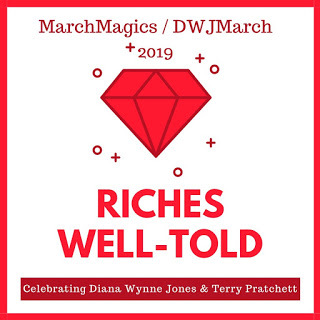 Oh, I'm excited about March Magics! 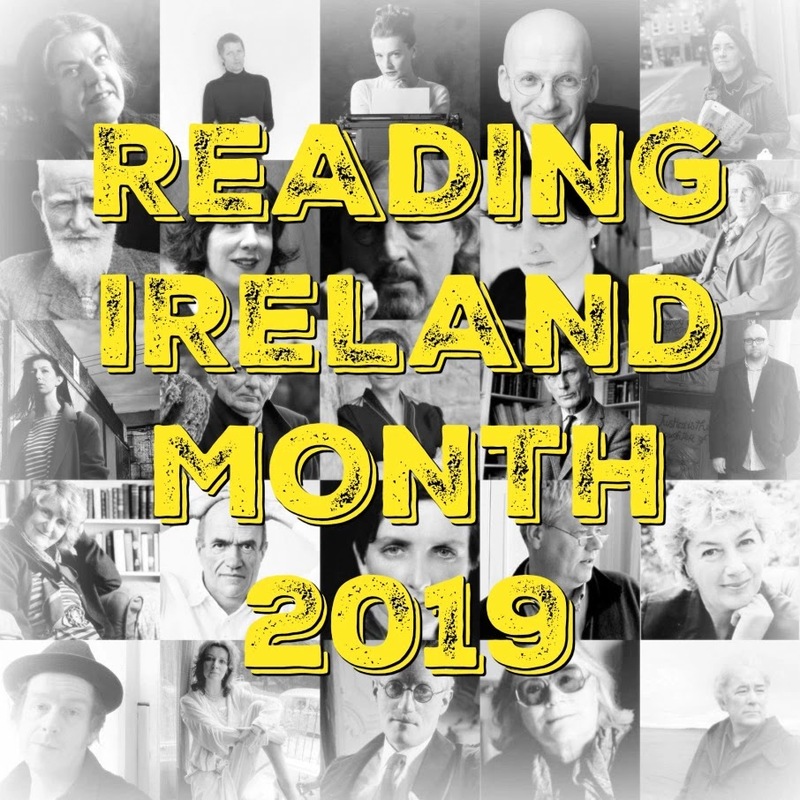 There is going to be all kinds of good stuff going on in March, what with the Welsh literature event, and isn't there an Irish one too? 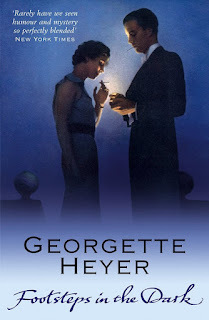 I always enjoy a good Heyer novel, though I don't always review them here. The last one I read was just OK, so I didn't post about it, but it wasn't bad either. On the whole, I think we should all admit that Georgette Heyer was the best writer of Regency romance-comedies ever. She simply cannot be beat. Her dialogue is always great, her comedy excellent, her detail and knowledge unmatched. And The Unknown Ajax is one of the best of the romances that I have read. The Darracotts are not a united family, and they are headed by the irritable -- nay, enraged -- Lord Darracott, who is particularly angry that his eldest son got himself killed in an accident. Now the family must accept an estranged and unknown cousin -- from Yorkshire! 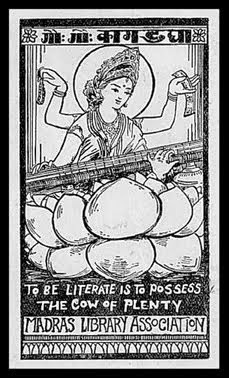 who is half commoner! -- as the heir. Major Hugo Darracott arrives, a huge and amiable man, and everybody expects him to be both stupid and vulgar. Anthea, the young lady of the house, is particularly irritated by Hugo's arrival, for Lord Darracott's solution to the problem Hugo presents is to make her marry him. She is therefore icy and unwelcoming, but once Hugo persuades her that he has no intention of marrying her, they become good friends. 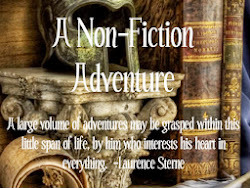 Anthea's younger brother Richmond presents a problem, for he is eighteen, enormously energetic, and completely thwarted in his desires to join the Army. He has nothing to do but get into trouble. There is a romance in this story, but it's almost incidental compared to all the other action crammed in. A mismatched and feuding cast of cousins, the local free-traders and the Preventative men who want to catch them, and all sorts of complications take up most of the book, and it's all great fun. 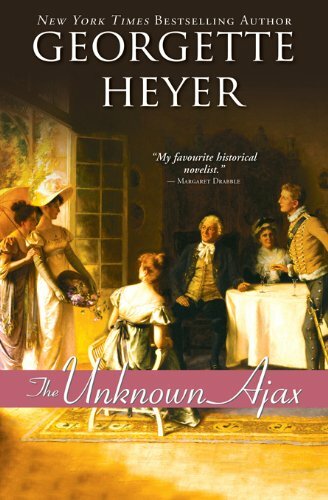 I find Heyer's mysteries to be less dependable than her romances, but I always read a new-to-me title if it's available. This one was a fun surprise, and I think it's one of her better mysteries. Celia, Peter, and Margaret, siblings, have unexpectedly inherited a crumbling estate, so they decide to check it out and have a holiday -- along with Celia's husband Charles. All the locals warn them it's haunted by the Monk, a terrifying robed apparition, but they are modern, educated people and don't believe in ghosts. The weird sounds, the strange events, the skull that bounces down the stairs...they don't convince everyone to flee, although Celia is pretty freaked out. And why does half the village seem to be in their garden all the time? It's very much a Scooby-Doo, Three Investigators kind of plot. Very well done, too. I was pretty excited when I spotted this novel on the donation table; it's currently not that easy to find in the US. It's also shorter than I expected! This cover make it look kind of like a kid's book but I would say that it is maybe more YA. It's one of those novels that kind of defies age categories, really. The story is told in two interlocking parts: one side is mythic, about the far past and about the whales. The other is narrated by a young Maori man, and it's really about his niece, Kahu. 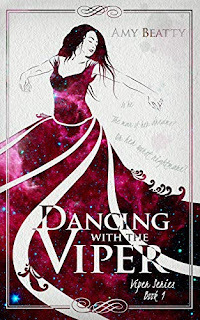 She is the first-born of her generation, and the family patriarch, Koro, is extremely displeased, because he expects a boy to be the chief and carry on the family heritage -- they are descended from the legendary whale rider. Kahu adores Koro, and spends her childhood following him around, bouyantly ignoring his indifference. When an entire pod of whales beaches near the village, Koro believes that it's a watershed moment for his family. If the whales can be saved and persuaded to go back to the sea, it will be a new birth for the humans of Wharanga too. If they can't, it will be the end. But the ancient bull whale that leads this pod misses his wonderful rider. Is there anyone to take his place? It's a beautifully crafted novel, and I enjoyed every bit. A film was made in 2002, and I'd like to watch it. They made Kahu older (which makes sense; the novel takes her from infancy to maybe 10 or so, and they would have needed five or six actresses), and this film seems to have more martial arts than the story does (which is none). Looks pretty good, yeah? It won an award at Sundance. I've been pretty excited about this book. Once I finished reading the actual Germania, so that I could understand this one, I was able to get started. (I shall continue the chain by reading about one of the terrible consequences in Timothy Snyder's Black Earth.) Krebs packs his book with lots of fascinating information, but it's quite dense and I went pretty slowly because I found it hard to concentrate sometimes. The second I drifted even a tiny bit, I'd lose the train and discover that I had no idea what the last two pages had said. Krebs starts off with plenty of background for Tacitus and what was going on in the Roman Empire at the time. Of course, Tacitus never set foot in the unconquered territory of the barbarians; he didn't study the Germanic tribes in person or anything. He draws the tribes as the descendants of an autochthonic earth god, Tuisto, and his son Mannus (which just means 'human'); they've remained 'pure and unmixed' with other tribes because their land is so grim and cold and unpleasant that nobody else wants to live there. 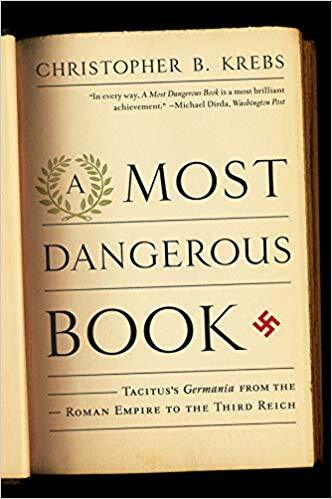 Tacitus wrote with his eye on contemporary Roman government and society, not on anthropology; he wasn't so much describing actual Germanic tribes as drawing a contrast with his own society. 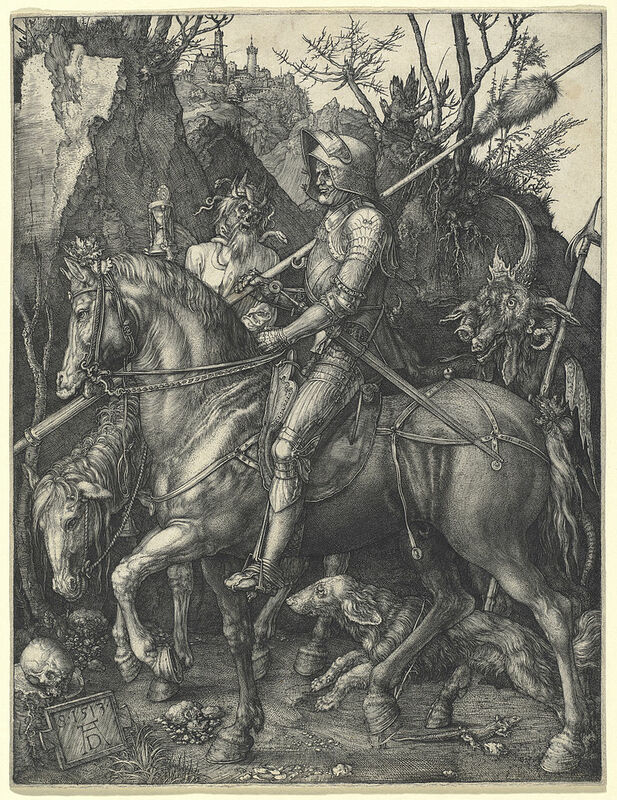 Germania proved to be a popular work and hand-written copies were sold at bookstores. We then have to skip ahead over a thousand years, to Renaissance Italians excited about finding old manuscripts in monasteries. Books had been preserved carefully in monastic libraries, but they were not necessarily known to the outside world. Certain Italians made something of a competition out of digging up unique books, and one of these was the Germania, hidden away in a German monastery. This was a wonderful find, but humanists took it a little too seriously as real ethnography and went right ahead applying it to their own day. Italians sneered at the 'uncivilized' Germans, and German humanists grasped desperately at a chance to prove that they too had a proud and ancient heritage of strong, honest, loyal warrior-farmers. This required a good deal of twisting of the actual text, but never mind. Krebs then traces a complex and ever-growing movement of Germanness through several hundred years. Tuisto was remade as a Trojan prince and even as a son of Noah. Perhaps German was the Adamic tongue? Well, if not, it was definitely ancient and pure and passed down from the Tower of Babel. Whatever the favorite issue of the day was, scholars could use Tacitus and their imaginations to prove that Germanness was whole, unmixed, and unique to itself (in a never-ending, endlessly expanding repetition of that one single paragraph from Germania). It's all pretty depressing, but reading it all at once like this is also a salutary exercise. Krebs traces the development of this belief, which became pretty much a religion to some, from its beginnings, and in doing so shows how very hollow and insane the whole thing was. 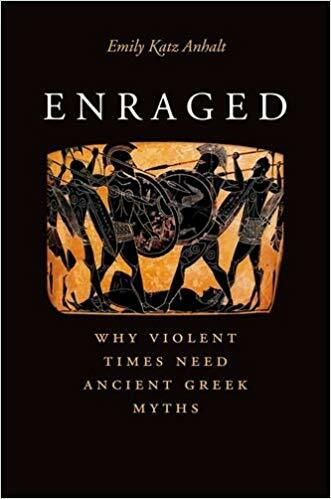 The whole racial superiority thing developed from a wish to show those snotty Renaissance Romans that Germans were just as good as they were, and that developed from a pamphlet written to remind a certain few ancient Romans that tyranny is bad. I guess there's no limit to the human ability to invent and rationalize reasons to do nasty things to each other. 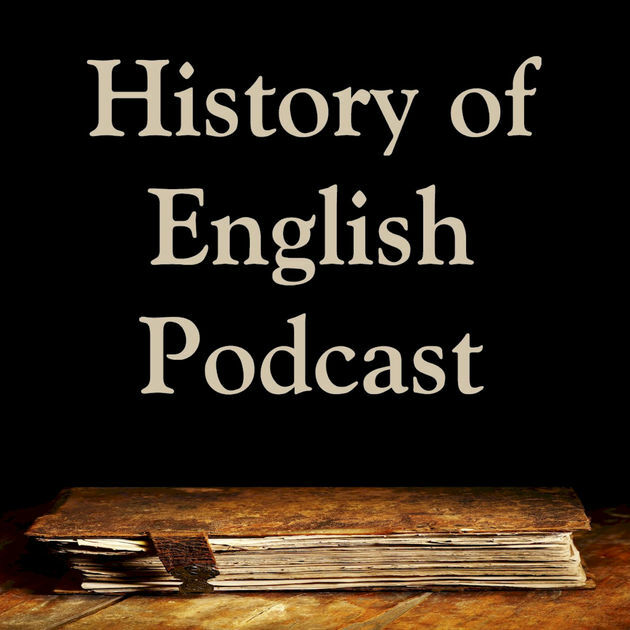 The History of English, by Kevin Stroud. This might be my very favorite podcast. Kevin starts with Indo-European and takes us on a detailed, fascinating trip through the history of the English language. 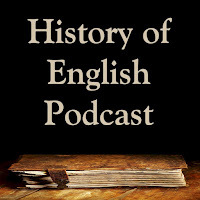 I'm on episode 62 and we're almost to the Norman Conquest, so there is a lot of information! 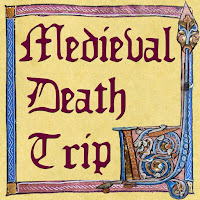 Medieval Death Trip, by Patrick Lane. I'm the last to know about this fabulous podcast; my mom told me about it. In every episode, Patrick reads a selection from a lesser-known medieval text and then talks about it. 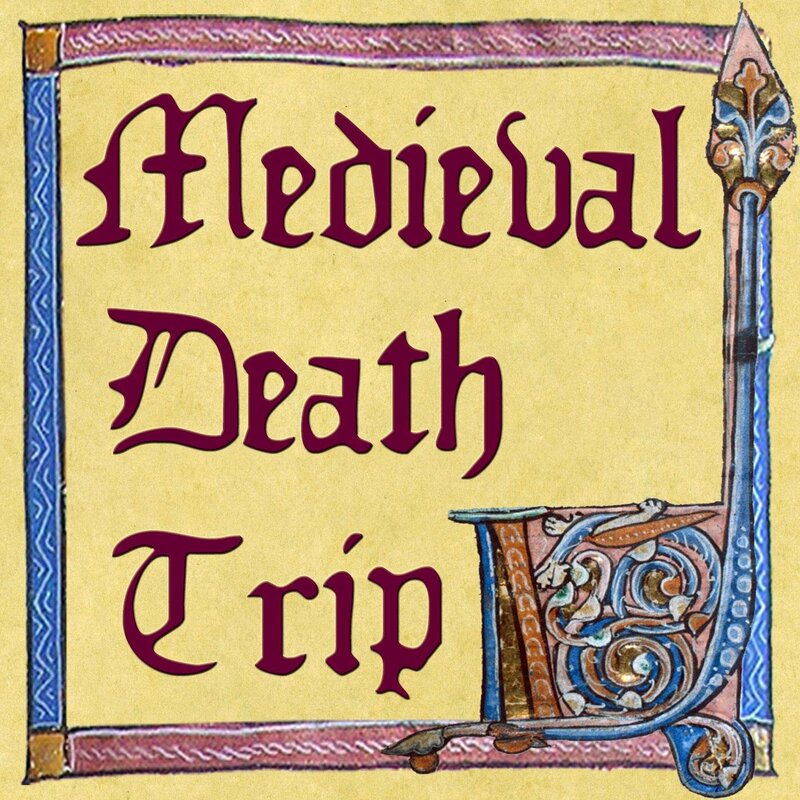 It's great and anybody with the slightest interest in medieval history will want to listen to it. Clear and Present Danger, by Jacob Mchangama. I listen to several free speech podcasts, but this one is the most relevant here. 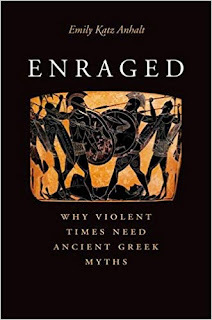 This is a global history of free speech, starting with the ancient Greeks. It's pretty great information, and there's the bonus of listening to Jacob's homey (to me) Danish accent. Slightly Foxed, by Gail, Hazel, and others. 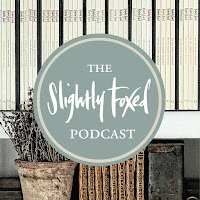 While I adore the Slightly Foxed books and ideals, I am not a subscriber. I do the next best thing and listen to this podcast, which is still in its infancy but so far has been lovely. 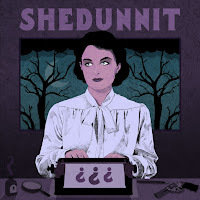 Shedunnit, by Caroline Crampton. This is my newest discovery; I've only listened to one episode out of the eight. It's a very new podcast too! 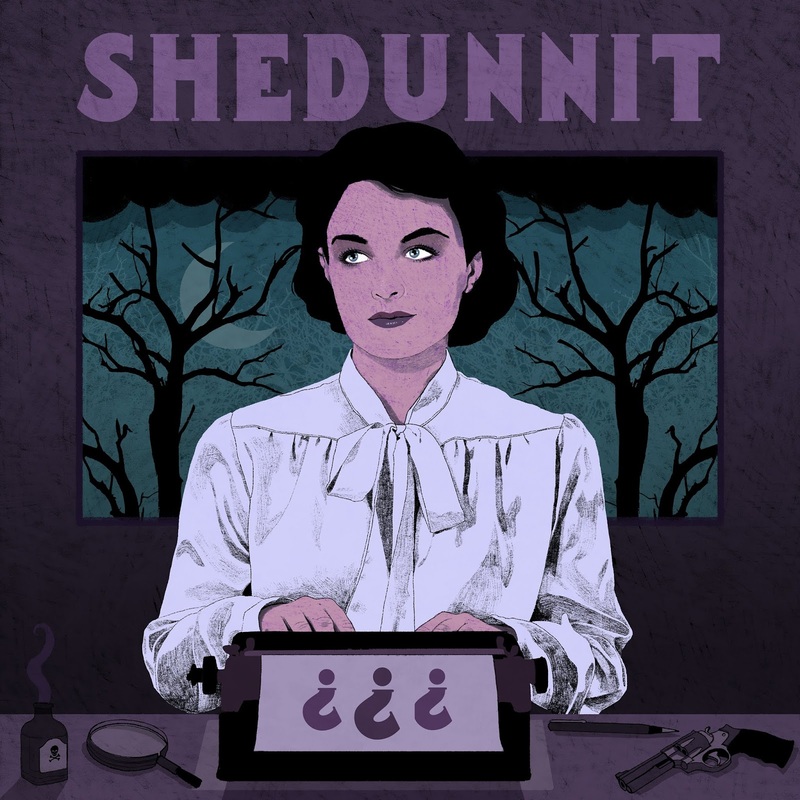 It's about the Golden Age of detective fiction and the women who wrote the books. My coworker, a true crime podcast addict, hooked me up with this one. I have other, non-literary, podcasts I listen to as well, but I figured those were not as relevant. Maybe you'll find something here to enjoy. 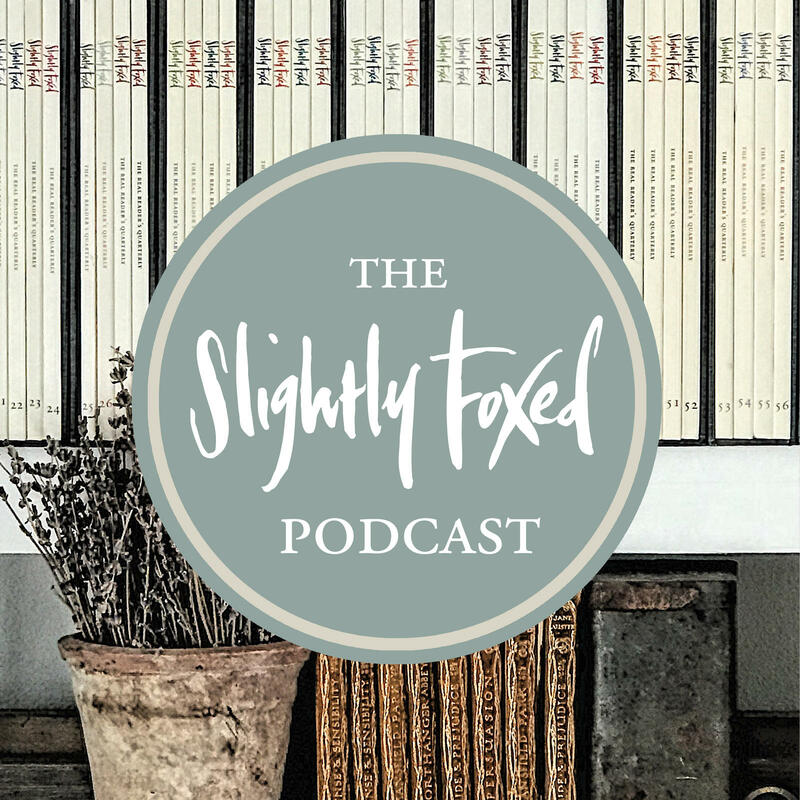 Do you have favorite bookish podcasts to recommend?